It's great that you work out before you get to work. But don't sell yourself short by ignoring your nutrition. Recover your muscles while you make your living! Your habit of hitting the gym before you head to work is a good one. With your workout out of the way and your metabolism already humming, you set yourself up for success. Despite this great sweat-before-dawn habit, if you're not thinking about your recovery strategy, then you might not be hitting your goals as quickly or efficiently as you could be. If you work in an office, you have a much greater chance of making a full recovery because you're able to rest for the remainder of the day. People who have more active jobs might have a more difficult time recuperating from an intense squat session. No matter where you recover, food and drink make all the difference in giving your muscles the tools and fuel to repair and rebuild. It's not something to take lightly. Worried your office diet isn't helping you? Don't stress. We've got the answers right here. Right after a workout, your muscles are most sensitive to taking in nutrients. If you aren't feeding your body after you train, your muscles will stay broken down longer. After you get out of the gym, eat simple carbs and high-quality protein. The best bet is usually a whey isolate or a whey/casein blend with some form of carbohydrate powder like waxy maize or maltodextrin. Some people like to have real food with their protein, so eating cereal or a bagel works fine. As long as you don't suffer from blood glucose problems, try to keep your carbs simple. Your goal is to get a slight insulin spike to help drive glucose into the muscle cells. Eat your meal or shake within 30-60 minutes of finishing your training session. This means that if you leave the gym and head directly to the office, you might have to supp-and-drive. If your gym is close to your workplace, mix a shake and grab a bagel when you get there. Feel free to add some recovery-based supplements to your shake. Glutamine, creatine, or BCAAs are great choices. Timing them after your workout can increase your recovery. When mid-morning hits, follow up your post-workout meal or shake with a substantial, long-lasting meal. Choose a complex carb and some quality lean protein. Try to keep fat out of the picture, because you're still in the anabolic window. Try something like a cup of brown rice or quinoa with white fish. If that's not appealing in the morning, grab some oatmeal with fat-free Greek yogurt. You'd also benefit with a brief walk or a few light stretches. This will help to get the blood flowing and keep your muscles loose. While resting to allow for recovery is good, many people will find that if they remain totally sedentary for the remainder of the day, they battle some pretty serious muscle soreness the next day. For lunch, go for something a little lighter and include all three macronutrients. If you include fats, they'll help balance out the carbohydrates and keep your blood sugar stabilized. If your goal is fat loss, you can remove the complex carbs at this point and eat only lean proteins, healthy fats, and vegetables for the rest of your meals. Here are a couple of easy meals: Bring a Tupperware dish with grilled chicken, diced vegetables, and a little olive oil dressing, and toss them together in a whole wheat pita. 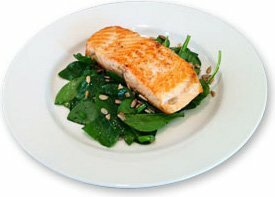 If you're reducing carbs, bring grilled salmon with a spinach salad and fresh berries. Sometimes, that mid-afternoon slump is tough. Instead of slouching in your chair and half-heartedly playing Tetris, grab some food for energy and focus. It may seem obvious, but I'm going to say it anyway: Coffee is no substitute for a good diet. You know who you are! As usual, protein is best. If you still have rooms for carbs, grab a piece of fruit. If you don't, have some almonds, avocados, or other healthy fats. If you have a busy afternoon on your plate, make sure you at least get a protein shake. Casein is a good choice because it will break down more slowly and give you a steady stream of aminos over a longer period of time. 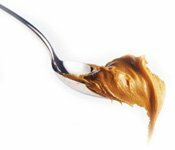 Canned tuna, or a banana or apple with some peanut butter, are both easy at-your-desk pick-er-uppers. Even though you can finally relax on your couch, it's no reason to stop feeding your body nutrients. Schedule time for a healthy dinner and follow it with a simple pre-bed snack. If you're too tired to cook when you get home, pre-cook your meals on the weekend so there's no prep, almost no cleanup, and most importantly, no excuse. Remember, the workout is just a small part of a healthy lifestyle. To recover well, you need to eat well. If you do, you'll be all ready to hit the gym the next day for your coming session better than you were before.